The Dutch Pastry is totally different then American pastry. From my experience the American cakes can be a tat bit too sweet, but that is just my opinion. And as far as icing goes, the Dutch usually use whipped cream. 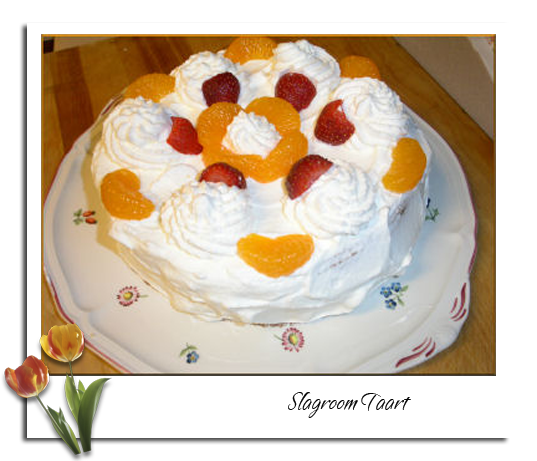 On birthdays and other special occasions, all kinds of cakes and cookies are eaten, including appeltaart, whipped cream cake (what you see here) , gevulde koek (cookies filled with almond paste), Kruidkoek, Limburgse vlaai, Spekkoek(from Indonesia), Ouwe wijven koek, Sprits, Tompouce, and Stroopwafels. The Dutch usually drink coffee and or tea with the cake. Dutch thrift led to the famous standard rule of only one cookie with each cup of coffee; it has been suggested that the reasons for this can be found in the trade-mentality and Protestant upbringing. A popular Dutch story (that has never been confirmed) says that then-Prime minister Willem Drees’s wife served this to a visiting American diplomat, who then became convinced that the money from the Marshall Plan was well-spent. Cafe au lait is also drunk often. It is called Koffie verkeerd (Coffee-the-wrong-way-around). Preheat the oven to 185 C 350F, Butter the spring form and set aside. Put the eggs, sugar and the vanilla sugar in a bowl. Put the bowl in the sink with warm water. The sugar has to dilute while you are whipping it. Whip it till thick and fluffy the color should be light yellow. Carefully fold the cake flour in the mix. Pour in the spring form and bake for 25 min. Test if the cake is ready (use a toothpick and see if it comes out clean). Let it cool and cut the cake in half ( you can do that with tooth floss). Add the whip it and sugar to the heavy cream and whip it. Don’t whip it too long otherwise you will get butter. Spread some strawberry spread on one side and add a layer of whipped cream. Then top it off with the top and also spread a layer of whipped cream on top of it and on the side. The last thing you do is add the fruit. Keep cool in the refrigerator. The Dutch Pastry is totally different then American pastry. From my experience the American cakes can be a tat bit too sweet, but that is just my opinion. And as far as icing goes, the Dutch usually use whipped cream. On birthdays and other special occasions, all kinds of cakes and cookies are eaten, including appeltaart, whipped cream cake (what you see here) , gevulde koek (cookies filled with almond paste), Kruidkoek, Limburgse vlaai, Spekkoek(from Indonesia), Ouwe wijven koek, Sprits, Tompouce, and Stroopwafels. The Dutch usually drink coffee and or tea with the cake. Dutch thrift led to the famous standard rule of only one cookie with each cup of coffee; it has been suggested that the reasons for this can be found in the trade-mentality and Protestant upbringing. A popular Dutch story (that has never been confirmed) says that then-Prime minister Willem Drees's wife served this to a visiting American diplomat, who then became convinced that the money from the Marshall Plan was well-spent. Cafe au lait is also drunk often. It is called Koffie verkeerd (Coffee-the-wrong-way-around). Preheat the oven to 185 C 350F, Butter the spring form and set aside. Put the eggs, sugar and the vanilla sugar in a bowl. Put the bowl in the sink with warm water. The sugar has to dilute while you are whipping it. Whip it till thick and fluffy the color should be light yellow. Carefully fold the cake flour in the mix. Pour in the spring form and bake for 25 min. 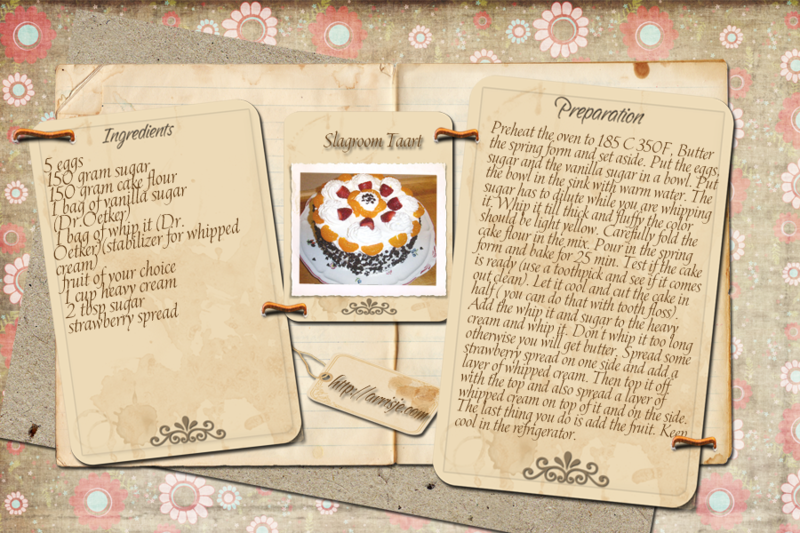 Test if the cake is ready (use a toothpick and see if it comes out clean). Let it cool and cut the cake in half ( you can do that with tooth floss). Add the whip it and sugar to the heavy cream and whip it. Don't whip it too long otherwise you will get butter. Spread some strawberry spread on one side and add a layer of whipped cream. Then top it off with the top and also spread a layer of whipped cream on top of it and on the side. The last thing you do is add the fruit. Keep cool in the refrigerator.